This recipe is perfect for busy workday meals, a la Nigella style. It’s ready in less than an hour and tastes fabulous! Just as Nigella Lawson says, “delicious food is not complicated”. 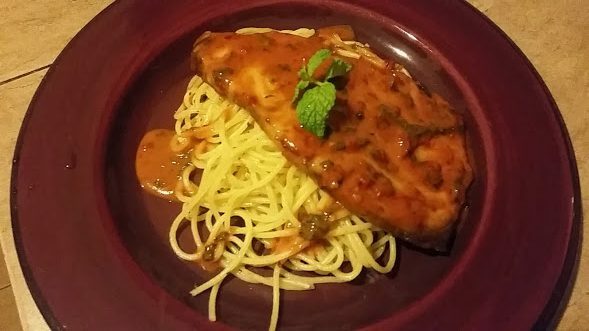 I know grilled fish with Thai flavours and spaghetti aglio olio sound like an extremely weird combination. But trust me. It works. The spaghetti could easily be substituted with glass/ egg noodles, but I like the texture and taste of the al dente spaghetti against the spicy fish. Fusion at its best. The fish is can easily be cooked over a grill or even pan seared, if you don’t own a grill. It’s best to use a firm fish for this dish, so it doesn’t crumble when you’re searing/ grilling it. I used sailfish (or thalapath, as is commonly known across Sri Lanka). Let the fish marinade for about a half-hour to 1, so the flavours are enhanced well. In a bowl, mix all the ingredients for the marinade. You may adjust amount of chilli paste/ brown sugar depending on your spice level. I generally like my food quite spicy, but the above ratios are just about right… not too spicy/ sweet/ bland. *I used ready-made curry paste and sweet chilli sauce from a store. You can make your own if you like, but the ready made condiments are perfect for quick meals. The Heritage brand has great flavour and is what I use around the kitchen for Thai cooking. ** Fresh red chillies add quite a bit of heat to the marinade. You may use dried chillies instead or omit them altogether. Combine the marinade with the fish fillets and set aside in the refrigerator. In the meantime, prepare the sauce and the spaghetti. Cook the pasta in boiling water, until al dente. Drain and place into a large mixing bowl. Add the rest of the ingredients, toss well and set aside. Now, you can start grilling/ pan searing the fish. On a grill/ large pan, add a little oil and place the fish fillets on a medium high heat. Cook the fish well; about 3-5 minutes on either side. While the fillets are cooking, prepare the sauce. On a medium heat, add the coconut milk, red curry paste and chilli sauce and mix well. Add the sliced chillies and mix. There will be some marinade remaining in the pan, before grilling the fish. Add this to the sauce and combine. Remove off heat and set aside. And now it’s on to plating! On a plate, serve generous portions of spaghetti, topped by a slice of fish. Pour some sauce over the top of the dish. Garnish with a small sprig of mint and serve!